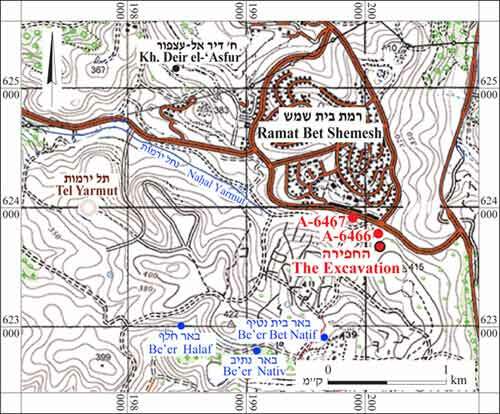 During April 2012, a salvage excavation was conducted at Ramat Bet Shemesh just north of Nahal Yarmut (Permit No. A-6486; map ref. 200082–121/623676–715), prior to construction. The excavation, undertaken on behalf of the Israel Antiquities Authority and underwritten by the Ministry of Construction and Housing, was directed by I. Zilberbod, with the assistance of N. Nehama (administration), A. Hajian (surveying and drafting), A. Peretz (field photography), I. Lidski-Reznikov (pottery drawing) and E. Belashov (final plan). 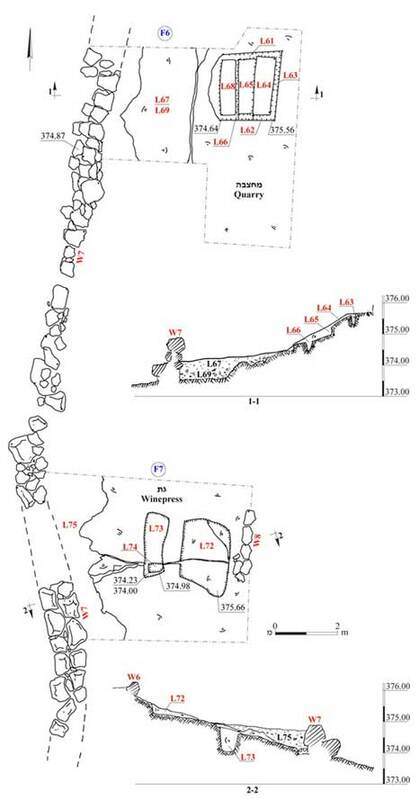 A winepress and small installations were exposed in a former excavation conducted nearby in 2012 northeast of the site (Permit No. A-6466). A section of a road from the Early Roman period was uncovered in another excavation conducted that same year c. 150 m west of the site (Permit No. A-6467). The excavation was located on the eastern slope of a hill, north of the Nahal Yarmut channel (Fig. 1). 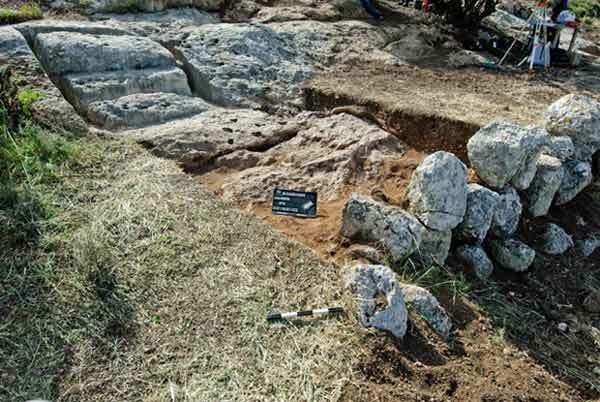 A quarry and rock-hewn winepress dating to the Early Roman period, and a field wall dating to the Byzantine period, were exposed (Fig. 2). Quarry (Figs. 3, 4). 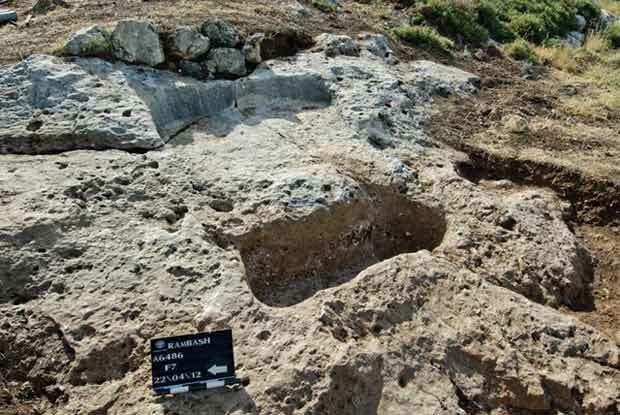 A small quarry (c. 2.0×2.5 m) was exposed in the northern part of the excavation area. 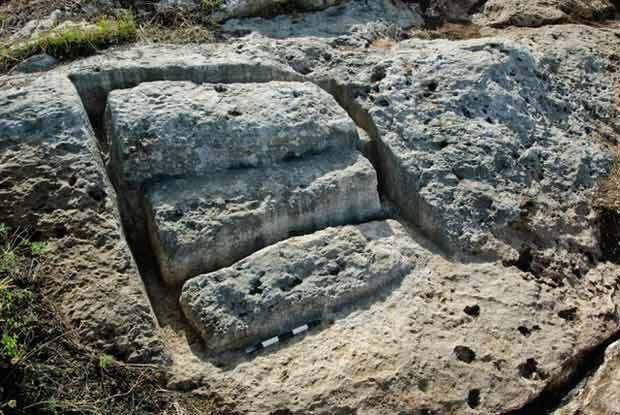 Three large rectangular stones that were not detached from the bedrock (L64, L65, L68; c. 0.5×1.8 m, max. height c. 0.5 m) and four separating channels (L61–L63, L66; length 2.0–2.5 m, width c. 0.15 m, depth 0.2–0.3 m) were preserved in the quarry. A level of tamped soil and small stones (L69) were exposed above the bedrock west of the quarry. Fragments of pottery vessels from the Late Hellenistic and Early Roman periods were discovered on this level, among them bowls (Fig. 5:3, 4), jugs (Fig. 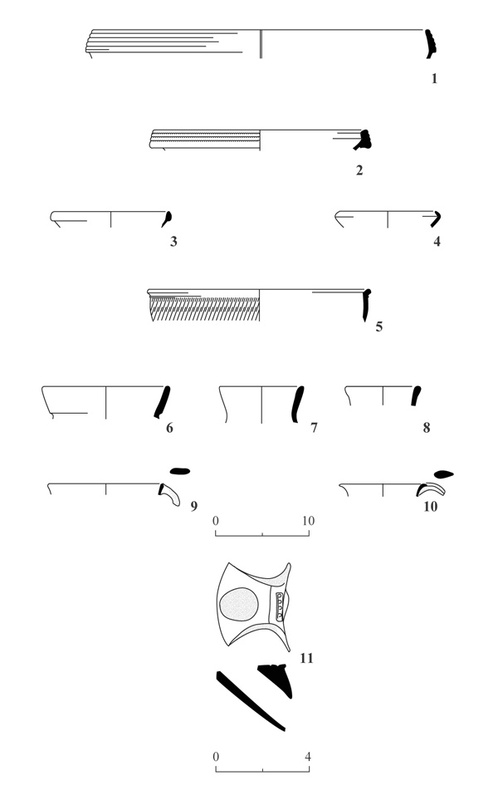 5:6, 7, 10) and a lamp fragment (Fig. 5:11). Winepress (Figs. 6, 7). 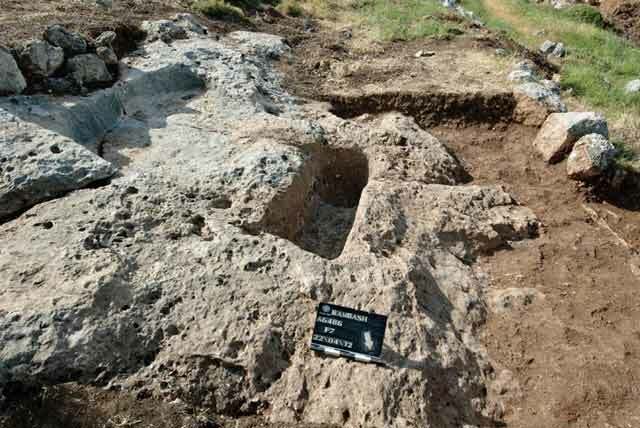 A rock-hewn winepress was discovered c. 15 m south of the quarry. It consisted of a treading floor (L72; 1.5×2.4 m) and a collecting vat (L73; 0.6×2.0 m, depth 0.8 m). The treading floor sloped west toward the collecting vat and was delineated by an upright bedrock side (height 0.02–0.35 m). A shallow natural channel (length c. 0.5 m, width c. 0.15 m, depth c. 0.1 m) used to convey the must from the treading floor to the collecting vat. A sump (L74; 0.30×0.45 m, depth c. 0.2 m) was hewn in the bottom of the collecting vat, at the southern end. The fill uncovered in the collecting vat consisted of soil, stones and potsherds from the Early Roman period, including bowls (Fig. 5:1, 2) and jugs (Fig. 5:8, 9). Field Wall. A field wall (W7, exposed length c. 25 m, width 0.6–0.9 m, max. preserved height 1.5 m) built on a bedrock outcrop was uncovered west of the quarry and the winepress. The wall was abutted by a layer of soil, which contained various potsherds, including a bowl fragment from the Byzantine period (Fig. 5:5). 3. A quarry, looking southeast. 4. A quarry and a field wall, looking northeast. 6. A rock-hewn winepress, looking south. 7. A rock-hewn winepress and a field wall, looking southeast.